There is a free and magical add-on, called Asap utilities. You can even select a sheet in Excel and change case (although it has some problems with non English characters, for example when converting Ç to lowercase and vice versa the cedille is lost) or delete empty leading-trailing spaces (useful in glossary maintenance). Search/find and/or replace in all sheets at once. Shows all matches in a box which allows you to walk through the results easily. Easy to find text across all sheets. Also has the power to deal with special characters such as line feeds (alt+enter), carriage returns and tabs. Place your selection in the center of your screen. Easy because you don't have to use the scrollbars. The custom formula error message makes it easy to display a custom message for formula errors. This means that in stead of e.g. #VALUE! You can have your own (more logical) error message displayed. Convert the value or formula in selected cells to the way they are formatted. This function will put ['EUR 24,-] in cell A1. Copy formula's exactly. Normally you have to block all references with $ if you want to achieve this. Not with this function. It will copy all formula's exactly without changing any references. 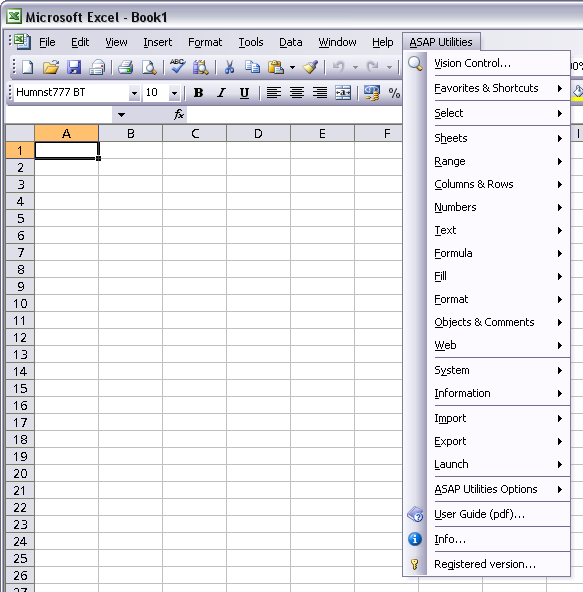 Move the data in your cell's, without the formatting. Just like the copy and paste as values, but now moving. Copy multiple selections. Something that is normally not possible in Excel. Transpose data with formula. This will transpose your data and keep the correct formulas. Empty duplicates in selected cells. This will empty all duplicate values that are found. The first cells containing the duplicated value will keep its value. Randomizes a list by row. 17, 16, 15. This utility works for selections in one row or one column. Remove all rangenames in your selected range. Remove all rangenames in the entire workbook.